DMG Audio's EQuilibrium enables you to create the perfect EQ for your situation. Step 1: Let's go through some of the cool stuff you can do by mixing and matching EQ filters! We're using Logic Pro X for this, but you can use any DAW. Start by dragging HouseBass.wav, HouseDrums.wav and HouseFX.wav onto the arrange page before selecting the regions. Now set the region to loop on playback. Step 2: Next, add DMG Audio's EQuilibrium (a 30-day demo version is available) to the HouseDrums track. First, we'll add some weight to the bass end using a low shelf. Double-click in the bottom half of the plugin to add a new band, then right-click the band's On button and select Low Shelf. Set the Frequency to around 40Hz, then apply 2dB of Gain. Step 3: Right-click Subtype to see the plugin's low-shelf filter shapes. Try each to hear how they shape the sound - we've chosen a Pultec boost, which is more aggressive than the other curves. Our drums now have more low end, but the mid frequencies have also been pushed up in the mix. To fix that, set this filter's special Cut control to 100% to apply a Gerzon curve to our shelf. Step 4: A low-pass filter is ideal to control the drums' high end. Add another band and set the Frequency to 18kHz before setting the filter type to LPF. 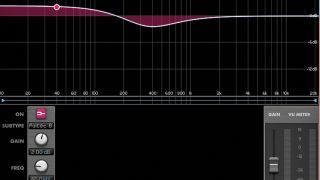 Again, there are a number of Subtypes for this filter - try them out and hear how their curves sound. We'll use the standard DMG one. The default slope setting is a tad extreme, so change it to a more gentle 12dB/octave before adjusting the Q slightly to bring out a little air - ours is set at 0.8. Step 5: Next, we'll boost the low mid of our bass - load another EQuilibrium on the HouseBass channel and add a new band at 350Hz with 3dB gain. We can change the sound of the filter with a different Subtype - we've used the DMG default as it's more configurable. Set the Gain>Q control at the bottom of the screen to 60% - the higher the percentage, the tighter the Q becomes as more gain is applied, helping us to hit the right spot. Step 6: Finally, let's use a low shelf to boost the weight of our bass. Add another band and choose the Low Shelf filter. Set the filter to 60Hz with 2dB of gain, then choose a suitable Subtype. By cycling through the options, you can hear how they affect the sound in different ways. We've chosen 4kg, a gentle shelf modelled on a classic SSL analogue EQ. You can, of course, stick to one filter subtype for all bands, basically emulating a classic EQ.